I am sure you all have come to the point at some time the standard trivets just will not work to support the jewel you have created. Times like this push us to be inventive. 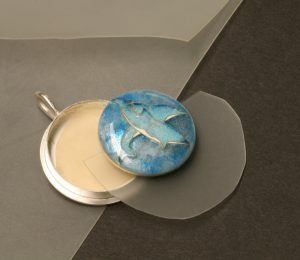 You can see this is an odd shape Plique a Jour Necklace, and in the enameling process, it needs to be turned different directions. This trivet is made from kiln fire brick and heat tempered wire. There is ordering information under resources for the wire. In the next trivet I have created a long thin cloisonne jewel and if I use standard trivets the enamel jewel would warp if the side could not be supported. Again this is kiln fire brick. You can use your jeweler’s saw to cut these shapes, then a half round hand file to make a grove to place the cloisonne jewel on. The sides are supported and the back is not touching the enameling trivet. This way the counter enamel that is required in this cloisonne jewel is just as pretty as the front. I have a fire cloth lying between the brick and the enamel so I will not have any of the firebrick dust in the enamel back. I have added this one this week as I was enameling cufflinks and needed a way to fire both sides at once and not have the enamel touching anything. Enameling trivets can also be a challenge when enameling in a trinket kiln. I see enameling artist searching the internet for a trivet to fit in the small trinket kiln. The first image is a one inch square of stainless steel, with the corners bent up. Using a pair of needle nose pliers you can easily place this trivet in and out of a trinket kiln. The next small simple trivet is made from the Heat Tempered Wire you can order and bend to your needs. This fits easily into the trinket kiln and the trivet will not disturb any of the enameling surfaces. 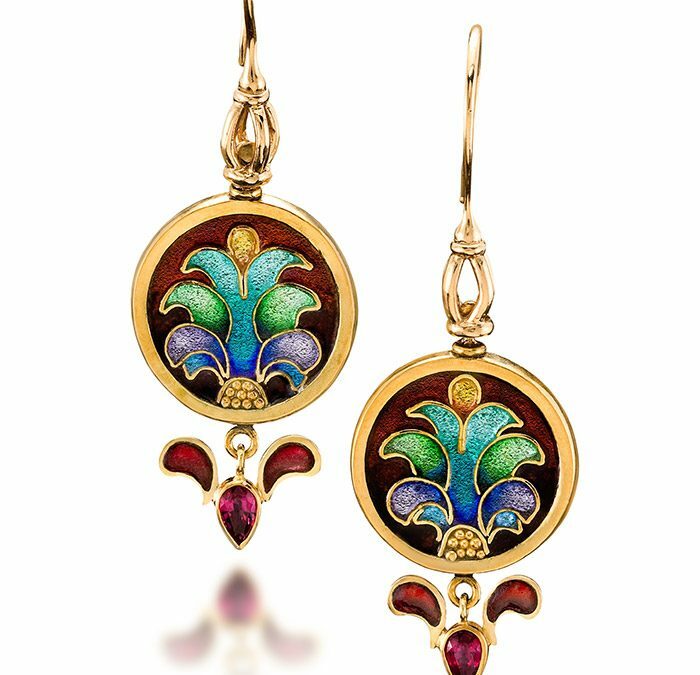 Although I prefer to set my cloisonne jewelry with 2.5 mm high 22k gold bezel with a thickness of 26ga and this is not on their chart, but they will supply it for you. When I am working in silver I will use the same sizes of wire for my settings just in Fine Silver. Lower on the page is their stock sizes of cloisonné wire this is 24k gold wire. The two marked with the * are stock, readily available. The .005 x.040 is the taller cloisonné wire and the .008. x .032 is the shorter in height cloison wire. I like to keep on hand 22ga 24k gold round wire as some times I need to pull it down, then roll it out, myself to create a very thin and short cloison wire as here on the back of these earrings. The total thickness of the cloisonné earrings is 1.5 mm. with a 24 ga fine silver disc in the center there is not much room for my cloisonné wires, yet I have them on both sides of the fine silver disc. The wires might be 1/8 of a mm here. On the front of the same earrings, you can see the wires are thicker and a bit higher. It is nice to be able to customize these wires to your need. When Andre 3000 from OutKast order the Mandrill Cloisonne Pendant, he wanted thicker cloison wires in the jewel. Here I cut the wires from fine silver sheet to achieve the look he was after. Tuff Break is the name of “That Rubber Stuff” I use to set my cloisonné enamel jewels. For several reasons in all my settings of enamels jewelry. One it adds protect the counter enamel while setting, by giving the enamel piece a cushion which help me not crack the piece during the process of closing the bezel over the delicate enamel edge. Secondly, it removes that clingy sound of the enamel against the metal once the piece is complete. Many enamelist use glues or a piece of plastic behind the enameled piece and even sawdust. I feel this adds a more professional element to the cloisonné jewel. See my setting cloisonné enamel jewels https://alohilanidesigns.com/setting-cloisonne-enamels/ and you will get a better picture what I an sharing here.